Our inn is located in a corner of the antique street, that Shirakawa flows. Shinmonzen,Furumonzen street our inn is located is area where Ukiyoe prints, Japanese paintings, antique art such as Buddha statue, and many antique shops line up. On the street, various items such as Ukiyoe prints, Japanese paintings, dishes, kimonos, cloths, incense, etc. are displayed. Shirakawa, right next to the inn, is a serene river where fireflies dance. Shirakawa is a cherry blossom spot. Many people visit in the spring. The river with the Egret and ducks is beautiful river where fireflies dance in summer. Our neigborhood is surronded by so many sightseeingspot which represents Kyoto. ① From Gionshinbashi (3 minutes on foot)to Hanamikoji(5 minutes on foot. 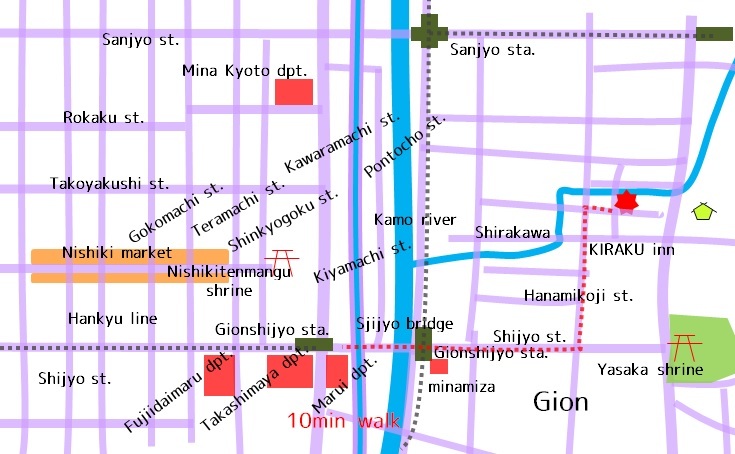 ②The symbol of Gion:Yasaka-shrine(5minutes on foot),Maruyama-park,Kodaiji-temple . 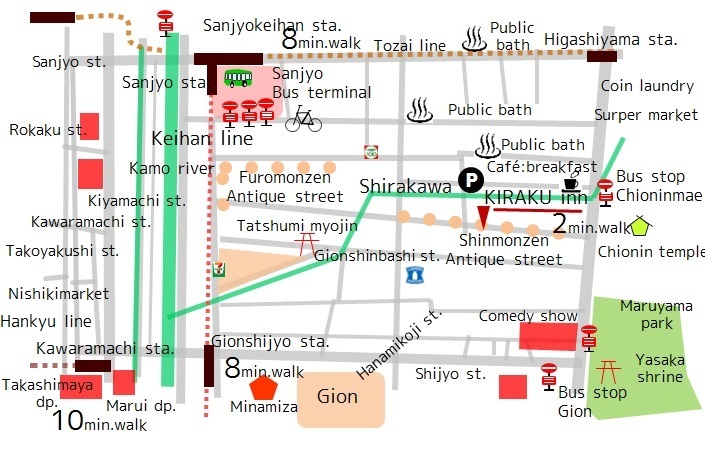 ④Kamo-river(10minutes on foot) ,Pontocho,Kiyamachi(11minutes on foot).Kawaramachi. Takashimaya, Marui, LOFT, UNIQLO, etc. are concentrated in the center of Kyoto.